Peanut butter and jelly sandwiches and cinnamon toast are two of my favorite childhood foods. Well, I guess I shouldn’t call them childhood foods because I still enjoy them today. 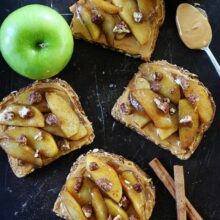 They are classics and will never go out of style, especially when you combine the two to make a Cinnamon Toast PB&J sandwich. This is the BEST PB&J I have ever had! I introduced cinnamon toast and PB&J to our boys and they are big fans as well. They are actually the reason I created this sandwich. One day, I was making peanut butter and jelly sandwiches for lunch and Caleb started whining because he wanted cinnamon toast. I told him I already had the peanut butter and jam out and that is what I was making for lunch. Being the smart 4-year old that he is, he said, what if I have cinnamon toast AND PB&J? 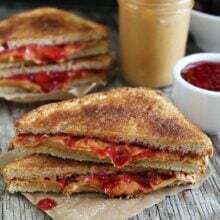 A cinnamon toast PB&J sounded good to me, so I made my boys a special PB&J. Of course, Maxwell wanted the same sandwich, he has to have everything big brother has. To make the sandwiches, I used Dave’s Killer Bread. I used the White Bread Done Right bread because it is my boy’s favorite and I like the nutritional label. 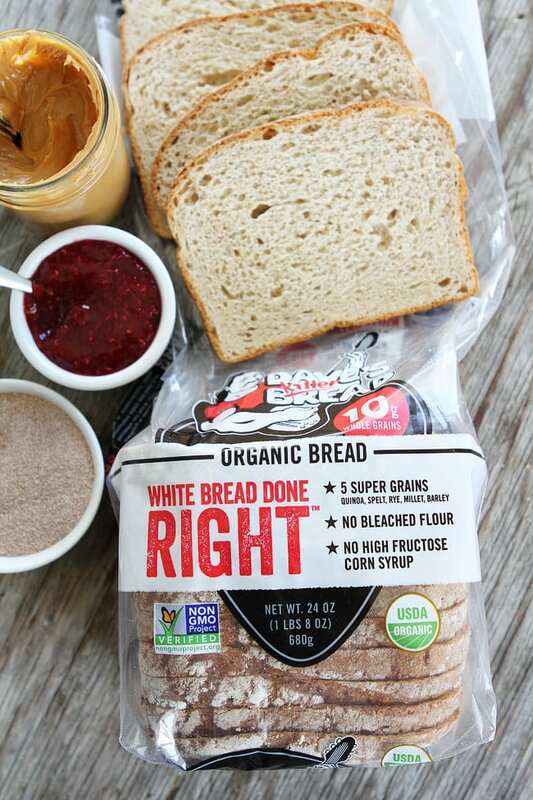 It has the most whole grains of any organic white bread. It is made with five super grains, 10 grams of whole grains and no artificial anything. With a golden color and perfect texture it is the perfect bread for sandwiches! First, I made cinnamon toast. 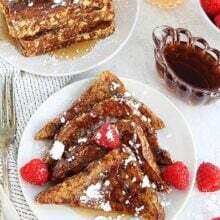 I spread softened butter on the bread slices and toasted them up in the oven with cinnamon and sugar. 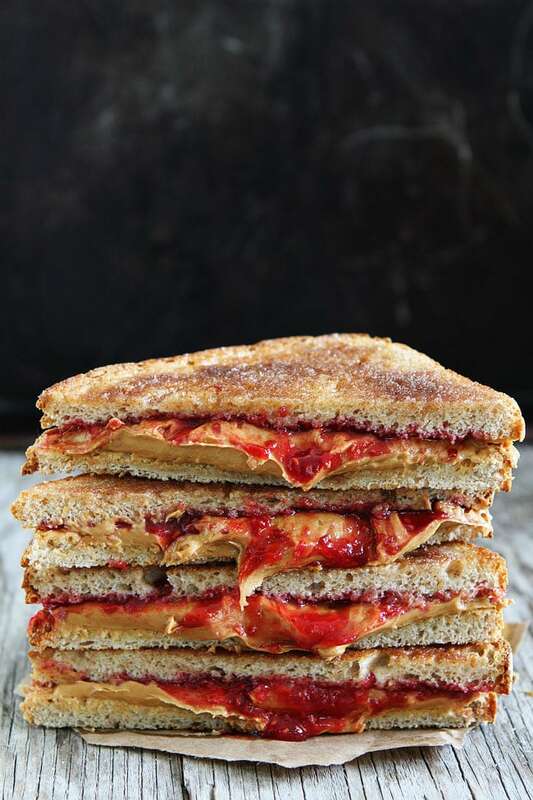 When the bread came out of the oven, I slathered on creamy peanut butter and raspberry jam. The toast was still warm so the peanut butter got a little melty…and messy! Trust me, it is SO worth the mess! 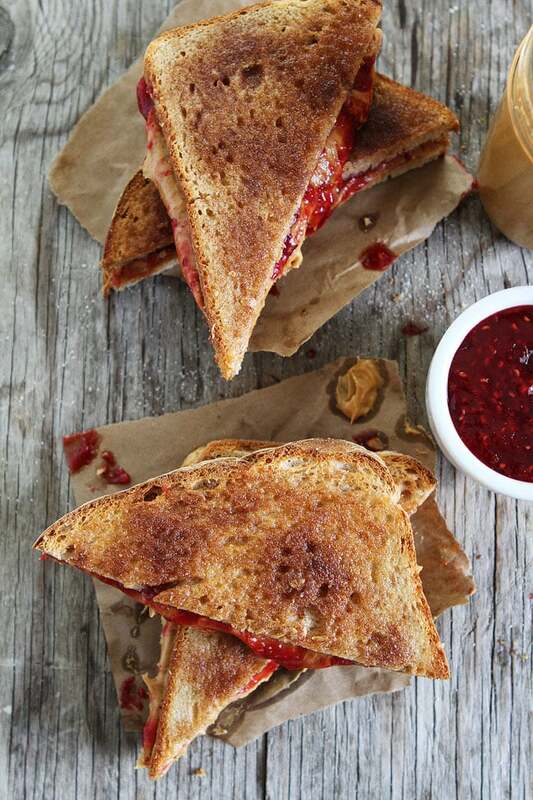 You have to try this Cinnamon Toast PB&J! The combo of two classics is amazing! 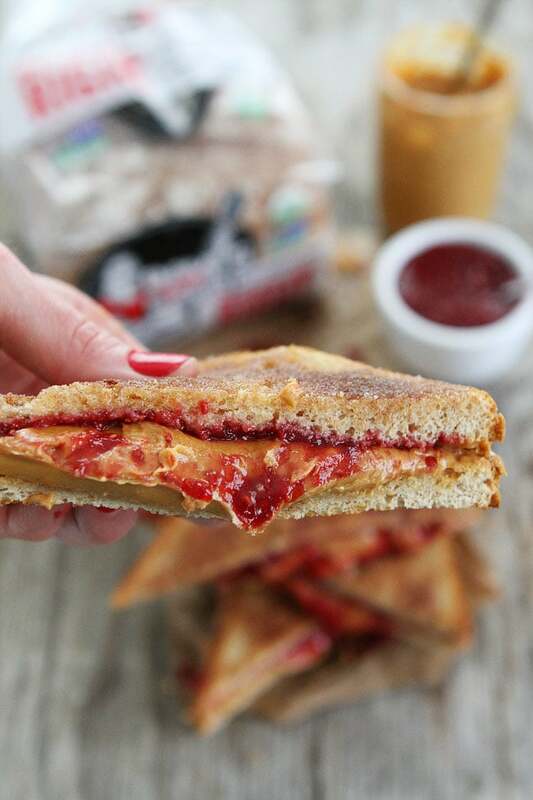 You might not have a regular PB&J again! 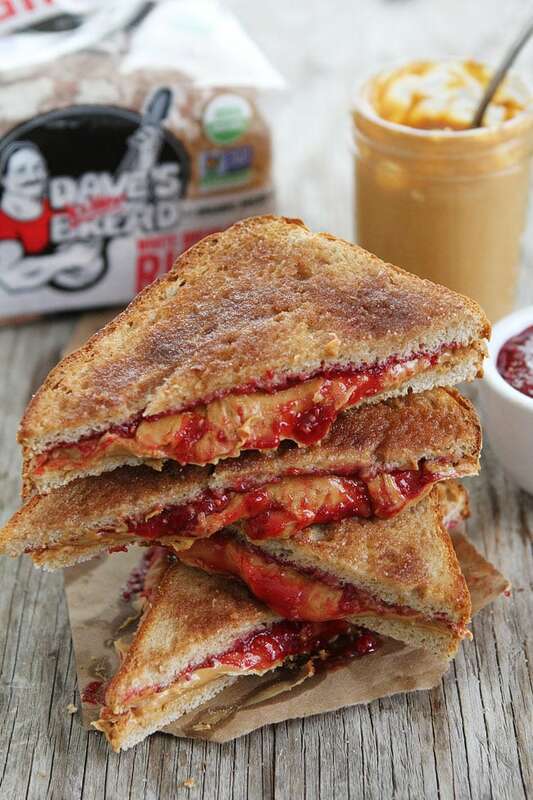 Two classics come together to create the BEST PB&J sandwich! Preheat the oven to 350 degrees F. In a small bowl, combine the sugar and cinnamon. Butter one side of the bread slices and sprinkle generously with the cinnamon sugar mixture. Put the bread on a baking sheet and place in the oven. Bake for 8-10 minutes. Turn the oven to broil and and broil until the sugar has melted and starts to bubble. This won't take long, so don't walk away, watch it closely. Remove from oven. Spread the inside pieces of bread with peanut butter and jam. Make a sandwich and cut in half. Serve immediately. Note-you can make cinnamon toast using a toaster, but I prefer the oven method. Use your favorite jam or jelly. This post is sponsored by Dave’s Killer Bread, but our opinions are our own. Thank you for supporting the brands that continue to make Two Peas and Their Pod possible. Maria! I almost cried when i saw this- my dad used to make us this as his “specialty” when I was really little and my mom wasn’t home- such wonderful memories! I loved the idea of using of five-grain organic bread to prepare the sandwich. 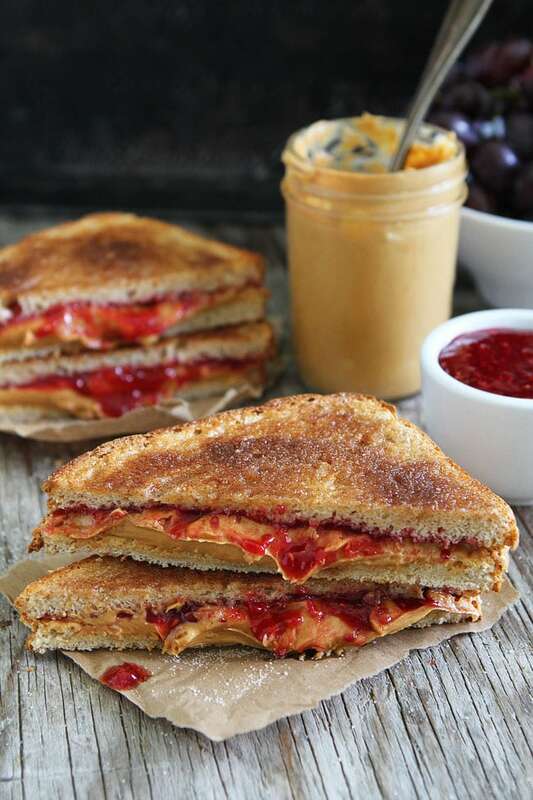 The oozing peanut butter and the glaze of jelly makes the sandwich look so delicious. This is brilliant! I don’t think I’ll ever look at a regular PB&J the same again. Sounds like you have a young recipe developer on your hands 😉 Great idea – this looks delicious! Such a good idea! I can’t wait to try try it with my boys. hey Maria This looks so yummy! Great idea! What a creative and yummy combo! 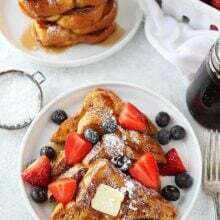 I love the cinnamon swirl bread from Kneaders/Great Harvest and I just made a batch of strawberry pineapple freezer jam today, so we’ll def have to try these! This sounds really tasty and while at first I thought it would be weird the longer I thought about it the better it sounded!